YORK HAVEN, Pa.: Scott Dellinger came into the Super Sportsman season at BAPS Motor Speedway with a different attitude. It wasn’t about winning a championship. Dellinger accomplished that a year ago and was focused more on getting to the front and finishing off wins. There was no set number. Four, five, or maybe six. Dellinger had no idea, just that he was going to have a different mindset. Never did he imagine that he would put together the best year of his career. Dellinger joined elite company Saturday night, collecting his fourth career Super Sportsman 100 victory. He joined Larry Jackson, Frankie Herr, and Dwight Leib as the only drivers with four or more wins in this prestigious event. “That’s an awesome crowd to be with,” Dellinger said. “We thrashed after time trials. We had a leaking fuel cell, and I guess we had a bladder get a hole in it. 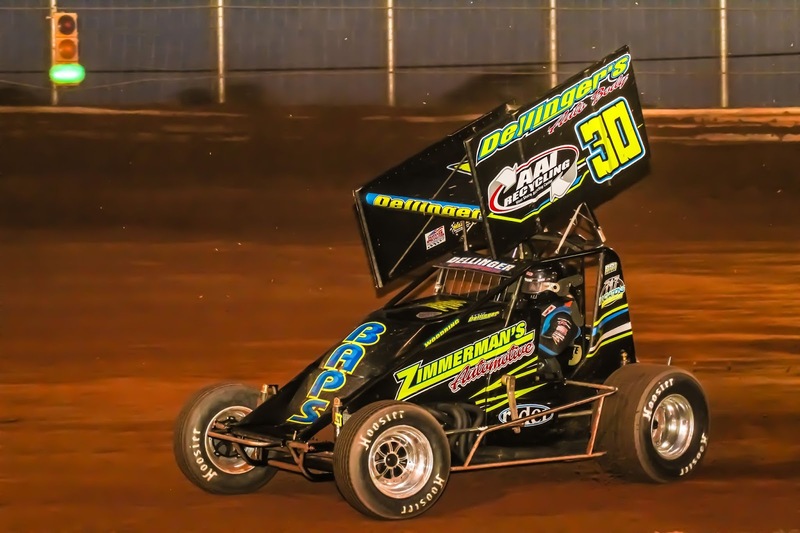 It was Dellinger’s eighth win of the season at BAPS Motor Speedway. He also has a victory this season at Williams Grove Speedway, giving him nine for the year. “I wouldn’t have guessed it,” Dellinger said of his season. “I told everyone at the beginning of the year that we weren’t point chasing. It was on everybody’s mind, but we came here to win, and I came here and drove more aggressive than I normally do. Dellinger might be more aggressive in 2018, but he is also driving smart. And, he showed that throughout the 100-lap affair. Chris Meleason started second on the grid and took the lead over pole-sitter Dave Conrad Jr. Dellinger, who started sixth, took his time getting to the front, saving his tires and picking off his competitors one by one. Dellinger didn’t get to Meleason until the halfway point. He stalked the leader for five laps before surging to the top spot with a low move through the first and second corner on Lap 56. “He was running a good line,” Dellinger said of Meleason. “He bobbled once, and I saw where he was bobbling. I don’t know, I guess it’s experience. Once out front, Dellinger was smooth in distancing himself from the field. Meanwhile, Kenny Edkin was becoming a factor. Edkin started third on the grid but went to the pit area early in the event. He restarted 19th and started to chip his way through the field, passing Meleason for the second by the time the 80th circuit was scored. Over the last 20 laps, Edkin was able to close. Dellinger didn’t have W-Link and was dealing with mud under the throttle and started to lose some ground. The final caution of the event came out on Lap 95 for Paul Miller, which set up a five-lap sprint to the finish. Dellinger hit his marks on the restart, and he was able to drive away for the satisfying win. “Two to go, I thought, ‘Man, this will be alright,’” Dellinger said. “I was sitting there watching the cars in front of me and then the caution came out. I wasn’t looking forward to that. I saw Kenny was behind me, and I was certain he was going to give it all he had. “I saw the checker, and it was about time. I was glad to see it. It felt like those last 30 laps took four hours. Edkin settled for second, followed by Chase Gutshall. Meleason hung on for fourth, with 16th-place starter Steve Fannasy coming from 16th to fifth to earn Sledgecraft Chassis Hard Charger honors. Chad Criswell earned $200 for setting quick time for the 33-car field with a lap of 16.984. Mike Enders and Bruce Buckwalter Jr. won the twin B-Mains. Jasen Geesaman dominated the Morgan Paving Aqua Fun Pools Street Stock main, leading the entire 20-lap event. Ryan Smith and Dustin Hollinger occupied the front row, but Geesaman made short work of the frontrunners, charging from fourth to first on the opening lap. He drove away the rest of the way for the win. Brian Walls was second, followed by Jim Palm, Chris Derr, and Chad Smith. Geesaman, Jason Townsend, and Hollinger were heat winners for the 24-car field. Super Sportsman Feature Finish, 100 Laps: 1. Scott Dellinger; 2. Kenny Edkin; 3. Chase Gutshall; 4. Chris Meleason; 5. Steve Fannasy; 6. Mike Enders; 7. Chad Criswell; 8. Frankie Herr; 9. Timmie Barrick; 10. Bruce Buckwalter Jr.; 11. Doug Dodson; 12. Matt Ondek; 13. John Edkin; 14. Nate Young; 15. Justin Foster; 16. Paul Miller; 17. Dave Conrad Jr.; 18. Tyler Wolford; 19. Todd Leonard; 20. Garrett Williamson; 21. Russ Mitten; 22. Davey Walsh; 23. Aaron Eichelberger; 24. Gregg Foster. Street Stock Feature Finish, 20 Laps: 1. Jasen Geesaman; 2. Brian Walls; 3. Jim Palm; 4. Chris Derr; 5. Chad Smith; 6. Kory Sites; 7. Brandon Wanner; 8. Bud Witmer; 9. Kyle Saylor; 10. Jamey Huls; 11. Jimmy Combs; 12. Kevin Sigler; 13. Marshall McMullen; 14. Bob Scott Jr.; 15. Jake Moser; 16. Shawn Liddick; 17. Will Walls; 18. Eric Tripp; 19. Scott Thunberg; 20. Doug Barber; 21. Dustin Hollinger; 22. Ryan Smith; 23. Matt Wampler; 24. Jason Townsend; 25. Bobby Meixsell.